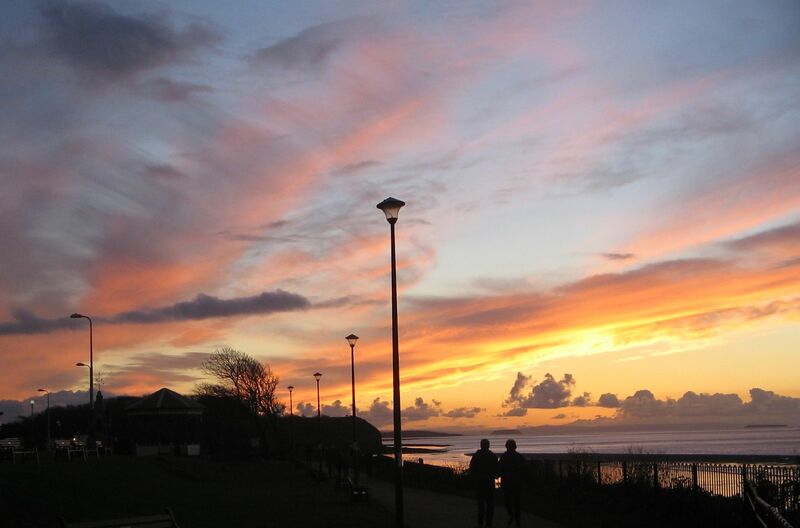 November in Clevedon – all change! We are used to making fresh starts in the new year – resolutions and spring cleaning and all that, but I’ve always found the Autumn more of a time to take stock. Maybe it’s the mild melancholy that the change in the clocks induces; the return to waking up in the dark and going for sunset walks at 4 pm. All I know is, it is at this time of the year when I tend to make decisions and changes. It was this time of year two years ago when I bought the Coat of Motivation, my very lovely winter coat, which was only just big enough at size ?? . I was struck with the certainty that I would not allow myself to go up to size ? ?+1 ( although I guess that should that be +2, with the way dress sizes work) and so immediately set about a completely voluntary programme of sticking to proper meals, no snacks, and picking up the exercise. Wii Fit worked wonders for me, providing some extra activity every day, and I got into Zumba too. The pounds dropped off, and I was as fit as I’ve ever been. Following our move here, the fitness regime evaporated. I’ve been working from home, so the daily brisk walk to and from County Hall was lost, and as I was considering my options for work I couldn’t commit to a class. We’ve also been visiting pubs and eating places! Inevitably the pounds have been piling on and the fitness levels have dropped, so yet again, I have needed to take myself in hand. This time it’s the gym, something I have never tried before. I am into week three now, and am already feeling the benefits. It definitely helps that I can go at off-peak times – today Alec and I were the only people in there at midday – and also to have a gym buddy. You really can’t be bullied or persuaded into new habits; the decision to change has to come from within. We all need a metaphorical coat of motivation! So I won’t be feeling quite so glum about the over-indulgence approaching. Our Christmas Day definitely revolves around food rather than presents, as family and friends are only too aware! We have found that our ideal menu consists of something between 5 and 8 courses, spread out over the day. It sounds mad, but actually means a lot less work. None of the courses are huge and most can be prepared well in advance, so no-one is trapped in the kitchen with the sprouts. There are breaks in between for games, walks, and Christmassy whatevers, and the eating and drinking goes on from lunchtime to late. Pate and crackers at about 11.30, maybe chicken liver or smoked mackerel or a nice spicy humus concoction. Soup about an hour later. A nice turkish lemon soup, or a borsch style beetroot soup. It has to be a bit unusual, zingy and festive. Maybe a nice sorbet to cleanse the palate? Or berries in a sparkling wine jelly? Just a couple of spoonfuls. Sometimes a fish course as well, or instead of the soup or pate. Spicy prawns and coconut went down well. A gap of about an hour before the main course. This year we are going for a leg of saltmarsh lamb. We had some earlier this year and I can’t tell you just how delicious it was. The lambiest lamb I have ever tasted. Our’s is ordered, so I feel safe in spilling the beans. Some nice vegetables and roast potatoes to go with it, but not too many, as we are only about half way through. Another decent gap and then fruit, nuts, cheese and crackers with maybe a glass of port. Petit fours and coffee to finish. When does the gym open?? This entry was posted in Health and tagged Christmas, Clevedon, diets, fitness, motivation.